The name Chios is possibly derived from Chiona, the name of Enopion's daughter. Other people believe that in the ancient Syrian language, "chios" meant "mastic", hence the name of the island. According to another theory, the name comes from the name of god Neptune's son, Chios. During the ancient times, the history of Chios island changed dramatically when Ionians came to live there, at about 1100 B.C. The island started to have an important role in the area, became a great navy force and was well-known for its wine ("Ariousios"). Conditions were favorable, so arts also grew during this period. It is believed that Homer, the ancient Greek epic poet, was born and lived in Chios during the 8th century B.C. Furthermore, a famous sculpture school was established during this time. The Ionean period, during which Chios florished, came to an end when Persians conquered the island, in 493 B.C. Persians destroyed the cities, as well as the vineyards and took many prisoners. In the end, Chian people managed to get rid of them and Chios took part in the Athenian Alliance. The city was re-built and Chios steadily made progress in every area, including trade and production of wine. In the seas, it was also a force to be reckoned with. Thucydides states that people of Chios were among the wealthiest of all Greeks. But this only last for about 50 years. During the Peloponisian war, Chios fought on the side of Athens. During the time when Alexander the Great ruled, there was a macedonian guard in Chios. When Alexander died, the island was in a periode of decline and was conquered by Romans. Although Chios was conquered, local people enjoyed some privileges but in the end Romans destroyed or took away many works of art of the island. When the Roman empire fell, Chios was made part of the Byzantine empire. That was the time when the main castle was made, as the location of Chios island was of great strategic importance. During the 14th century, Chios was conquered by Venetians and then by Genoans. Local people were oppressed under the Genoan ruling, but during this time the mastic trading and citrus fruits cultivations were organised. For 2 centuries, the island florished. Castle - villages, "vigles" and strongholds were built, giving Chios a special character, present until this day. Christopher Colombus stayed at the island for 2 years, during this period (some people claim he was from Chios). Genoans managed to keep Turks away until 1566. Chians' oppression continued, this time under the Turkish ruling which lasted for 300 years. Because of mastic production, local people keep some of their privileges and lived better than most other Greek people. 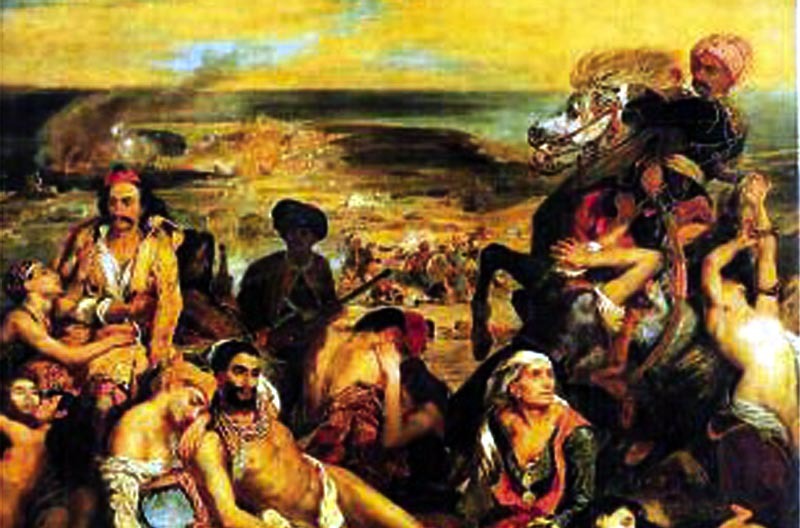 After a rebellion in 1822, the great massacre of Chios took place. The Turkish navy and army burned and destroyed everything for 2 weeks. Most local people were massacred. Renowned artists like Eugene Delacroix and Victor Hugo payed tribute to Chios slaughter in their works of art. Only few survived and rebuilt the city 10 years later. In 1881, the island's growth is suddenly abrupted because of a devastating earthquake. The island is almost deserted. Once more, local people have to rebuilt the island. Chios island was freed from the Turkish occupation in 1912 and became a part of free Greece. During World War 2, Chians resisted against the German forces. The island was made free two years later, along with the rest of the country.